I'm thinking they would be a good alternative to carrying traditional chains/cables because (I presume) they weigh less. I have RWD only. There is no way those will work as well as chains. Probably not. Especially not on ice. But chains have a lot of downsides. And these types of products can be effective. As someone that has logged hundreds of thousands of miles driving in mountain winter conditions in Norway, Vermont, Wyoming, Idaho, and Montana there is no way those snow socks are as good as a good set of chains. Just because the CHP will allow them in the slushy mess on Donner summit doesn't mean they are as good as aggressive chains are. Those spider spikes look a lot better to me. If you watch the videos online about these socks you’ll see that 1) they work exceptionally well and 2) they’re meant to get you out of a stuck situation, they’re not meant for prolonged use. In fact, driving with them on hard pavement for a mere moments will destroy them. The video states that they work as well as winter tires, not chains. Big difference. With the excellent weight distribution of the RWD Model 3 (44% front, 56% rear) all you should need is winter tires to make it to CA ski areas. If you need to carry traction devices for legal reasons, sure, throw in any lightweight device that meets the legal requirements. But, no, I wouldn't plan on actually having to use them, then you are limited to 25 mph (similar to old-fashioned chains). 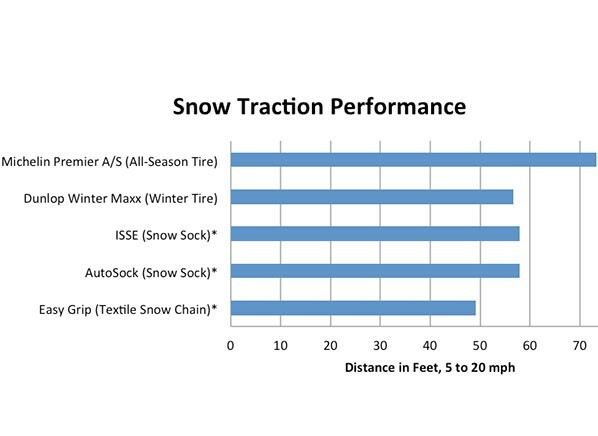 Judging from the test results they have less traction than a run of the mill winter radial. Seems they might also wear out quick. What is the best way to maximize the life of my AutoSock? Check out our Tips for effectiveness below or the PDF. to ensure the best performance and lifespan of your AutoSock. Use the proper AutoSock size for your tires for best performance. Always test fit before using. Don’t spin the tires, use a“lightfoot”on the accelerator. AutoSock is designed to increase traction on snow and ice. Driving on dry or damp roads significantly increases wear. Unlike chains, AutoSock is quiet so don’t forget that they are on! Do not leave AutoSock on your tires while parked overnight or parked for long periods when it will freeze. After removal, store wet AutoSocks inside where they will not freeze. I'll take my chances with the OEM tires over this, BUT I do have dual motor. AutoSock has been around for a while. I bought them for my AWD Audi about 15 years ago. However, I still have never needed to use them, so I can't comment on their performance. Nice, light package to toss in the car if you don't think you'll need real tire chains.